Should we stage our home? How does our home get staged? What is the cost of staging? What is the payoff of having our home staged? These are all questions that our clients ask us when they are in the process of deciding to sell their home. From working with a staging company, to doing "staging" on your own, there are many ways sellers can get their home ready for sale. The cost depends on several factors including how large your home is, what areas you want staged, and if you already have items in the home that can be used for staging purposes or not. Now more than ever, buyers are looking for homes that check off all the boxes. Buyers want their purchase to be justified by the overall quality and potential of the home. With an astronomical amount of inventory now available in Orange County, homes now have much more competition than they did before. Right now, there are 42% more homes on the market for this time of the year since 2012. Ultimately, we like to let our clients decide on if staging their home is the best option for them or not. Here are five reasons why us at Sari Ward & Team believe staging really is worth the time and investment. Imagine driving by an open house on a Sunday afternoon. What makes you decide to pop in to take a look? Most likely it is because you drove by a home with amazing curb-appeal. Staging the outside of your home is just as important as staging the inside of your home. You want buyers to be impressed with the property before they even step foot inside. This puts buyers in a positive frame of mind before they even walk through the front door. What makes you stop your continuous scrolling on Zillow or Realtor.com? Probably the fact that the featured image displays a great interior shot of the home which offers great designs. Staging your home will not only help the property photos to stand out online, but it also helps buyers to envision themselves living in your space. Most people do not live in expertly designed spaces like homes you see in home decor magazines and interior design blogs. Typically, people have lots of "things" in their homes that can distract buyers from envisioning themselves as the owners of a home. As buyers walk through your home for the first time, they will be looking for certain checklist items that they know they need in a new home. Of course this entails the number of bedrooms, bathrooms, etc. But they also want to make sure the price being asked is justified by the overall condition of the home. Buyers look for a well-maintained home. What does a well-maintained home have to do with staging you ask? Staging of a home means more than placing a new couch with some throw pillows in an empty living room. It means walking through your home and seeing what can be improved upon before placing it on the market. Are there light bulbs out in the chandelier? Are there scuffs on the baseboards? Do the walls consist of various colors that are outdated with todays trends? These are all things that are considered to be staging and that help the overall quality of the home being shown. As a seller, how can you stage your home in a way that helps buyers see themselves living in your space? One way of doing this is by "de-personalizing" the house. You do not want buyers to see your personal family photos everywhere, or your kids toys out in the family room. You want to do as much as possible to clean out the space so buyers can envision their families living in the space. When you stage your house, you’re essentially removing yourself so that others may insert themselves. Staging your home will make it seem bigger rather than emptying the space entirely. Why is this so? Rooms may end up looking smaller when they are completely empty in photos. Putting in furniture that accurately depicts the size of the space is essential with staging a home for sale. Staging companies do a great job of placing on trend furniture and knickknacks that accentuate a space to show buyers its best features. Also, showing buyers how a space can be laid out (especially if you have an unusual layout), can help buyers with making their decision on if the space works for them or not. Since you have to eventually pack anyway, you might as well get it over with early! You never realize how much "stuff" you have until you have to move. In order to stage your house, you must remove the clutter from the home. You also do not want your personal belongings out and visible when buyers are touring your home. The move out process starts early with the decision to stage your home. Sari Ward & Team has a list of amazing partners that help us stage our client's homes. 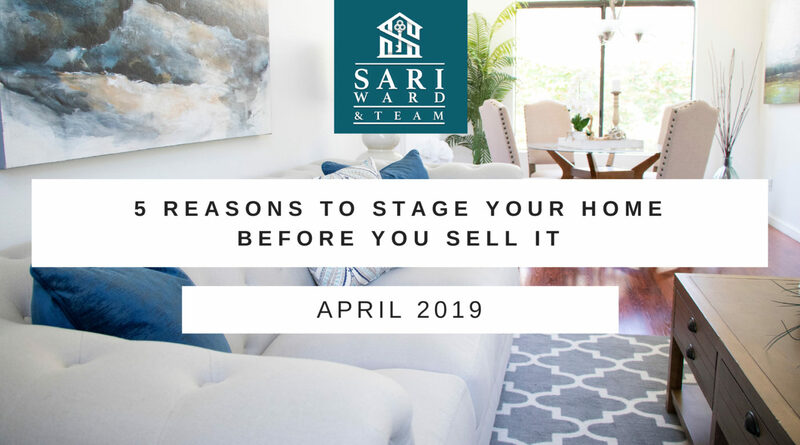 From painters, to contractors, electricians and of course, home stagers; Sari Ward & Team wants to give our clients the best help possible to prepare their homes for sale. Please contact Sari Ward at (949) 558-3100 for more information on staging your home and the current housing market.